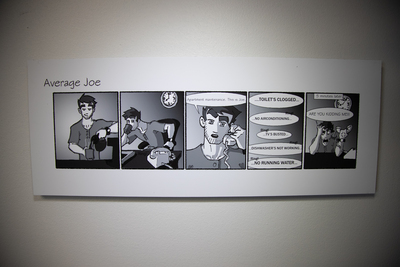 This piece is part of a larger work entitled Average Joe. I have always been a fan of Manga and Anime, which has had an influence on my drawings. I enjoy both the artistry and the stories of this particular genre. Over the summer, I stumbled on this artist named Philip M. Jackson or “Jollyjack” on Deviant art and his comic strip called “Sequential Art”. This is what inspired the creation of my comic strip “Average Joe”. Average Joe is based on a New Yorker named Joe Sullivan who works as a maintenance man at the apartment complex he and his buddies live in and all of their crazy adventures they get dragged into. In the first strip, I wanted to introduce the main character and his daily routine. He’s in a good mood and is getting ready to drink his coffee and eventually being overwhelmed with multiple calls about repairs in the first five minutes of getting started. I’m working on the idea that everyone can relate to, how we all get overwhelmed with projects and how a good mourning can easily get ruined. In the second strip, I wanted to introduce another one of the main characters in the “Average Joe” series, Hank. This time, instead of another human character like Joe, Hank is an anthropomorphic Doberman. In this strip, I wanted to show Joe and Hank enjoying a day off by watching football with a foreshadowing of the next strip where Joe receives an invitation to a party that night from one of their friends, Chad. I have always had a deep admiration for our military, so I depicted Hank’s character as a former Army man with a buzz cut, an Army t-shirt and a muscular build. In the strip, I wanted to create a sense that Hank doesn’t like going to parties, but is willing to go for free beer. Joe’s jersey number is actually a reference to my own jersey number when I played football in high school. In the third strip, I wanted to introduce the rest of the main cast of characters and their personalities based on the 5man band with 4 characters. Joe, obviously is the leader of the group, Hank is the tough guy, Chad is the cool guy and Huey is the nerd. Chad, the anthropomorphic hedgehog, being the cool guy is depicted as a rocker with the piercings, a thin build and a guitar pick which he wears around his neck. As for Huey, I wanted to introduce him as a nerd trying to look and act cool, but when presented with the opportunity to converse with women, he automatically reverts back to his shy and nervous ways. As for the girls in the piece, I wanted to create a sense that this was a regular party with beer pong, people drinking and talking. Since most of the main characters are anthropomorphic animals, it would only make sense if one of the girls was anthropomorphic also. The fourth and final strip is a holiday themed piece with the guys gathered together for Thanksgiving. I wanted to explore further into each character’s personality and deliver a nice message for the holiday. I chose to depict Chad as carefree and laid back, which is illustrated by his loose, unbuttoned shirt and piercings. This makes a nice contrast with the rest of the group, who are dressed up very nicely. I tried to show Huey’s wealthy background with the nicely combed hair, sweater vest, and his wearing a bow tie rather than a regular tie like Joe and Hank. Joe has prepared the meal, so I had him wearing an apron and carrying the turkey. Since it is a holiday themed strip, I drew an assortment of food you would often eat at Thanksgiving; pumpkin pie, turkey, dressing, mashed potatoes, gravy and biscuits. The message: “Giving Thanks! If you can’t be with Family, be with Friends!” is an homage to those who can’t spend Thanksgiving with their family because they are away from home or have no family. The point is we should always be thankful for what you have and grateful to be with people you love. © Ike James Sudduth, 2018.